I buy a lot of music. 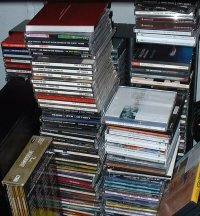 I've posted a few photos of a small part of my collection of CDs here. I'll note that in both photos, the CDs are two rows deep. This is in addition to over 1000 vinyl records, cassettes, and music DVDs. The point here is that the recording industry should be considering me as one of their best customers. With that in mind, I'm making a pledge right now to never buy another CD from Sony BMG, or any future version of that corporation. This is tough, because Sony BMG owns the back catalog of a lot of my favorite artists -- Bruce Springsteen, Simon and Garfunkel, Bob Dylan. But I've decided that I now have had enough of their corporate contempt, and can find other places to satisfy my musical cravings. If you haven't been following the tech news, you can catch up on it starting with this engadget.com entry. Short version: some Sony CDs automatically install software on computers when inserted in the CD-ROM drive; nasty, sneaky software that is as bad as any virus or spyware. Well, I don't need their product anymore. I'll be getting any new music from archive.org, where it's perfectly legal to download, copy to my hard disk, burn onto a CD, etc. And for the old favorites, why, I'm buying a new turntable. UPDATE: Another link, this time pointing out that Sony's licensing of these not-really-CDs-anymore is quite alarming. UPDATE: Wired columnist Dan Goodin goes even further, proposing a boycott of Sony. Sounds like a plan, because Sony is so far treating this as a PR gaffe, and still acts as though they did nothing wrong. Vaio PCs, Boycott Sony HDTVs, Boycott Sony Walkmans, Boycott Sony Radios, and all the rest. For extra Bonus points, when you see a Sony TV advertisement on a show, take 3 minutes to write the network and the TV show and tell them you have to boycott their network and boycott their show because of it's endorsement of Sony. Sony shouldn't have produced a product that can infect and harm computers when it is removed. The fact that government computers may have been infected leads to possible criminal charges under CyberTerrorism Laws. It would be interesting to see Sony Corporate people taken away in handcuffs the same way other virus writers get arrested. Even worse than the harm caused by this, is the fact that the Sony management did not anticipate the outrage and wrath not only of music lovers but of state and national governments. Sony managers should respectfully resign their jobs and save face, before they are fired by the board of directors. Even some board members should step down, in respect to the shareholders and investors who will carry the burden of loss caused by the multiple class action lawsuits and international cybercrime investigations. Sony's employees have brought Shame on their company, their families, and their nation.